Since Peterborough was only a half hour’s drive from our film company’s home office, we were able to case out the town in depth quite early on and realized that we could shoot the entire film there. We were also aware that if we could manage to contain the shooting of the movie to this one general locale, we’d stand a better chance of making our budget, whatever that turned out to be. So we had preliminary meetings with a number of town officials, including the town administrator and her staff, the Chamber of Commerce, the Chief of Police, the town Selectmen, and several other key organizations and folks who all helped pave the way for our future invasion. 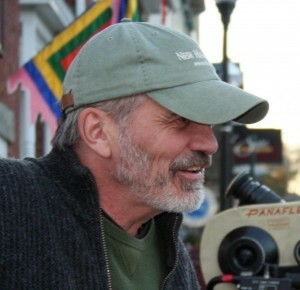 The New Hampshire Film and Television Office was instrumental in setting up these initial meetings along with Van McLeod, New Hampshire’s Commissioner of Cultural Resources–a man who is a true champion of the arts. We started all this groundwork close to a year before we ended up shooting the film and the ongoing cooperation from everyone was quite phenomenal–something that makes producing in New Hampshire so special. The final step was to set up a financial structure for the making of the film. This had two parts. The first was to put together a budget that as much as possible accurately reflected what it was going to cost to shoot, finish, and launch the movie. The second part was to set up the legal mechanism whereby the needed money could be raised. The initial budget for a film is crucial and in a very real sense is where the rubber hits the road. This is the document that estimates as accurately as possible how many dollars are going to be needed for each and every detail in the process of making the movie, from pre-production through post and beyond. The budget is fifteen to twenty pages of very small numbers in columns, with headings and subheadings, and subtotals and totals, ending in the one all-important final number. To look closely at a feature film budget is an education of how complicated moviemaking is–it certainly was for us. And it needs to be put together by someone who knows what they’re doing–an experienced line producer who will put down numbers you can trust are at least within the ball park for each line item. Once we had a reliable idea of what our final number would be–for us it came in at $950,000–we set about raising that amount of money. We formed a limited liability company for the movie called Sensation of Sight, LLC, hired an in-state law firm well versed in securities law–Gallagher, Callahan & Gartrell in Concord–and with their help structured the way people could invest in the company. And then the fun began…. Great post. Especially like the part of what a Line Producer is. Many times people see a list of names at the end of the credits of a movie and it all seems a blur but this explanation was simple and to the point of the position. Would be great in the future if you guys wrote a book on The Making of The Sensation of Sight and How to Make Independently Produced Films. Think about it. You guys didn’t just make a great film but are also able to explain your years of experience in simple terms. This keeps getting better. I look forward to the future installments. You are telling your story and in the process provide so much practical detail of the process. This is really helpful stuff.